May seed under Pegasus Search. Use as Equipment card. While aboard your ship, that ship has a Phasing Cloak (RANGE +4 while phased). 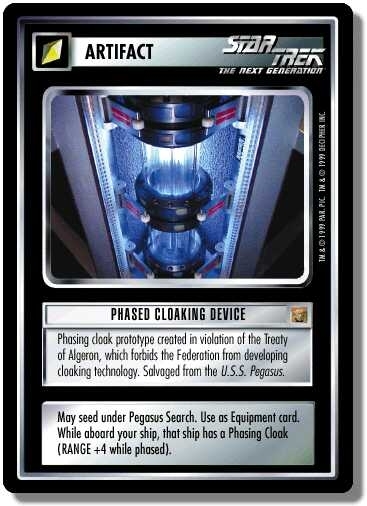 There are 47 entries for Phased Cloaking Device (ST1E 8 R 2) at the Tradeplace (65 haves and 10 wants). Click here to see all trade list entries for this Rare card!